Objective To investigate whether a dose–response relationship existed between exercise and subjective sleep quality in postmenopausal women. This objective represents a post hoc assessment that was not previously considered. Design Parallel-group randomised controlled trial. Setting Clinical exercise physiology laboratory in Dallas, Texas. Participants 437 sedentary overweight/obese postmenopausal women. Intervention Participants were randomised to one of four treatments, each of 6 months of duration: a non-exercise control treatment (n=92) or one of three dosages of moderate-intensity exercise (50% of VO2peak), designed to meet 50% (n=151), 100% (n=99) or 150% (n=95) of the National Institutes of Health Consensus Development Panel physical activity recommendations. Exercise dosages were structured to elicit energy expenditures of 4, 8 or 12 kilocalories per kilogram of body weight per week (KKW), respectively. Analyses were intent to treat. Primary outcome measures Continuous scores and odds of having significant sleep disturbance, as assessed by the Sleep Problems Index from the 6-item Medical Outcomes Study Sleep Scale. Outcome assessors were blinded to participant randomisation assignment. Results Change in the Medical Outcomes Study Sleep Problems Index score at 6 months significantly differed by treatment group (control: −2.09 (95% CI −4.58 to 0.40), 4 KKW: −3.93 (−5.87 to −1.99), 8 KKW: −4.06 (−6.45 to −1.67), 12 KKW: −6.22 (−8.68 to −3.77); p=0.04), with a significant dose–response trend observed (p=0.02). Exercise training participants had lower odds of having significant sleep disturbance at postintervention compared with control (4 KKW: OR 0.37 (95% CI 0.19 to 0.73), 8 KKW: 0.36 (0.17 to 0.77), 12 KKW: 0.34 (0.16 to 0.72)). The magnitude of weight loss did not differ between treatment conditions. Improvements in sleep quality were not related to changes in body weight, resting parasympathetic control or cardiorespiratory fitness. Conclusion Exercise training induced significant improvement in subjective sleep quality in postmenopausal women, with even a low dose of exercise resulting in greatly reduced odds of having significant sleep disturbance. Trial registration number clinicaltrials.gov identifier: NCT00011193. Sleep disturbance is prevalent in postmenopausal women, with 35%–60% reporting significant sleep problems. Effective, safe and easily available treatment options for disturbed sleep in postmenopausal women are lacking. There has been equivocal evidence as to whether exercise improves sleep in postmenopausal women, though possible dose–response effects have been noted. Exercise resulted in significant improvement in subjective sleep quality in postmenopausal women, with reduced odds of having sleep disturbance at postintervention with even 50% of the recommended dose of exercise for adults. The effects of exercise on sleep quality were independent of changes in body weight, resting parasympathetic control or cardiorespiratory fitness. The study constitutes the largest randomised controlled trial on exercise and sleep quality, using a structured dose of exercise and a validated measure of sleep quality. Only self-reported sleep was assessed; objective measurement of sleep, with either actigraphy or polysomnography, was not conducted. Despite the high prevalence of sleep disturbance in the sample, participants were not selected on the basis of sleep complaints. Disturbed sleep is a common complaint among women, with increasing prevalence beginning at the menopausal transition. Postmenopausal women are more likely to report sleep problems than premenopausal or perimenopausal women,1 with 35%–60% of postmenopausal women reporting significant sleep problems.2 The first-line treatment options for sleep complaints, hypnotic medication and cognitive behavioural therapy have associated concerns about the safety of long-term use or treatment availability, respectively.3 ,4 Furthermore, results are conflicting on the effect of hormone replacement therapy (HRT) on sleep quality,5 ,6 despite the effectiveness of HRT at reducing other menopausal symptoms. To our knowledge, no research has directly investigated the effects of different doses of exercise on sleep quality. The Dose–Response to Exercise in postmenopausal Women (DREW) trial was conducted to investigate the health effects of 50%, 100% and 150% of the National Institutes of Health (NIH) Consensus Development Panel physical activity recommendations in a group of sedentary postmenopausal women.13 Results on the primary outcomes of the study, cardiorespiratory fitness and blood pressure, have already been reported.14 Subjective sleep quality was also assessed in this trial as an exploratory outcome, and the data provided herein give the first systematic examination of whether a dose–response relationship exists between exercise and subjective sleep quality. It was hypothesised that, in comparison to a non-exercise control group, subjective sleep quality would improve with increasing dosage of exercise. A complete description of the recruitment and screening procedures has been published elsewhere.13 Briefly, the study was a randomised, controlled, multi-arm, parallel-group trial in which the primary purpose was to examine whether there were dose–response effects on cardiorespiratory fitness and blood pressure with incrementally increasing doses of energy expenditure.13 ,14 The study was approved annually by the Cooper Institute Institutional Review Board, and written informed consent was obtained by all participants prior to study involvement. Participants were recruited from the Dallas, Texas, metropolitan area from April 2001 to June 2005. Of 4545 women screened for eligibility, those who were aged 45–75 years, postmenopausal, sedentary (≤20 min of exercise on ≤2 days/week and <8000 steps/day, averaged over 1 week), overweight or obese (body mass index (BMI) of 25–43 kg/m2) and had normal to mildly elevated resting blood pressure (systolic blood pressure of 120–159 mm Hg and diastolic blood pressure ≤99 mm Hg) were eligible to participate (figure 1). Exclusion criteria included significant cardiovascular disease, recent hospitalisation for mental illness or significant symptoms of depression (score ≥10 on the Center for Epidemiologic Studies Depression Scale) or any other health condition that would contraindicate participation in an exercise programme. Overall, 464 women were randomised to treatment, with baseline sleep data available for 437 participants. Participant screening and study flow. Of 4545 screened for participation, 464 postmenopausal women were randomised to one of four treatments. 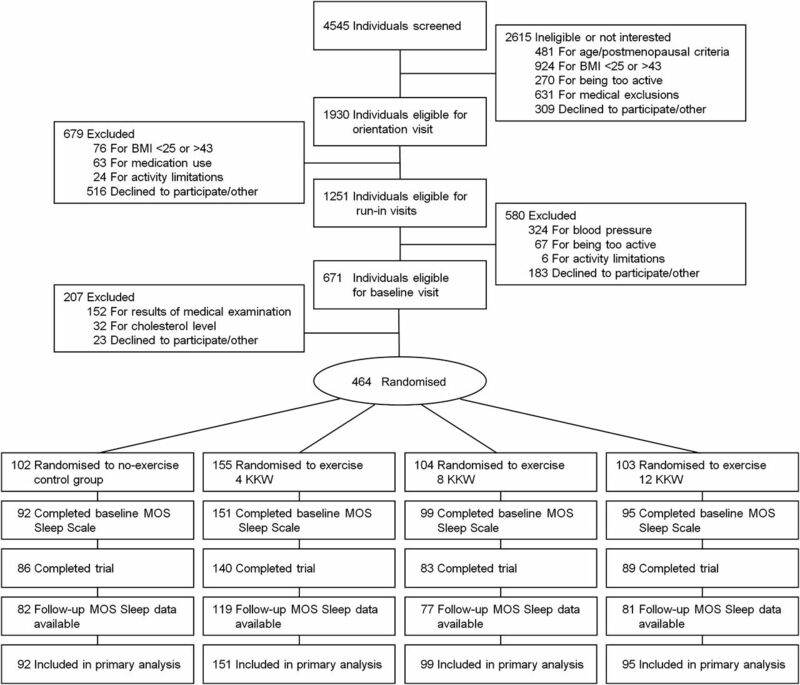 Baseline Medical Outcomes Study (MOS) Sleep data were available for 437 participants; those who discontinued the study or without follow-up MOS Sleep data had baseline data carried forward for analysis. BMI, body mass index; KKW, kilocalories of energy expenditure per kilogram of body weight per week. Women assigned to the exercise groups participated in three to four training sessions/week for 6 months, alternating between semirecumbent cycle ergometer and treadmill exercise. Training sessions were conducted in a supervised laboratory setting, and exercise dosage was closely monitored for each session. Training intensity was moderate, set at the heart rate associated with 50% of each woman's VO2peak and continuously monitored by heart rate telemetry. To determine the number of calories that needed to be expended each week, participants were weighed weekly and their weight was multiplied by the exercise dosage. Exercise dose was gradually increased to minimise injury risk. All exercise training groups expended 4 KKW during the first intervention week, with the 4 KKW group continuing at that dose for 6 months. The 8 and 12 KKW groups increased their energy expenditure by 1 KKW until they reached their appointed exercise doses. Although participants could not be blinded to their treatment, staff were separated into intervention and assessment teams to ensure blinding of all assessment staff to participant randomisation assignment. Participants were consistently reminded to refrain from discussing their randomisation assignments with outcome assessment staff. Baseline demographic and health characteristics were assessed by completion of a comprehensive medical history questionnaire. Height and weight were measured with a calibrated stadiometer and electronic scale, respectively. Diet was assessed before and following the intervention using a semiquantitative food-frequency questionnaire, whereas unsupervised physical activity was monitored throughout the study with a pedometer (Accusplit Eagle, Livermore, California). Cardiorespiratory fitness (VO2peak) was assessed from maximal exercise testing using a cycle ergometer (Excalibur Sport, Lode Medical Technology, Groningen, the Netherlands), as previously described.14 Testing was performed twice at baseline and twice at postintervention, with values from each timepoint averaged. Heart rate variability (HRV) was measured from the final 5 min of a 25-min resting assessment, as previously described.19 The square root of the mean of the sum of the squares of differences between adjacent R–R intervals (rMSSD), a marker of parasympathetic activity,20 was retained for analysis. Sample size was originally based on having adequate power to detect changes in the primary outcomes of the overall study, VO2peak and blood pressure.14 Additional participants were allocated to the 4 KKW condition to increase statistical power for detecting smaller anticipated fitness gains in this group. Because sleep was not a primary outcome in the design of the original study, there was no opportunity before data collection to investigate sample size or power for this outcome variable. Nevertheless, given the current enrolment, the study had 84% power (assuming two-tailed α=0.05) to detect an effect size of 0.20 for MOS SPI score reduction. Baseline sleep quality was compared against normative data17 using a one-sample t-test. Continuous MOS SPI values were examined across quartiles of BMI, parasympathetic tone (rMSSD) and cardiorespiratory fitness (VO2peak) with analysis of covariance (ANCOVA), controlling for age, BMI, sleep medication use and HRT use. The likelihood of having significant sleep disturbance at baseline (ie, MOS SPI >25) was evaluated with logistic regression across the same quartiles using the same covariates. Two primary outcomes were evaluated for the current study: (1) change in continuous MOS SPI score across treatment groups and (2) odds of having significant sleep disturbance at postintervention across treatment groups. Change in continuous MOS SPI scores across groups was tested by ANCOVA, with adjustment for age, BMI, sleep medication use, HRT use and baseline MOS SPI values. All assumptions underlying the ANCOVA models were checked and verified to be met. Individual treatment groups were compared with the control group with Tukey–Kramer adjustment for multiple comparisons. An α level of 0.05 was used because it was our a priori intention to compare only the separate treatment groups with the control group. Dose–response trends were analysed using least-squares regression of MOS SPI change across groups. Logistic regression examined the odds of having significant sleep disturbance at postintervention, following adjustment for age, BMI, sleep medication and HRT use, and baseline sleep disturbance (SPI >25, SPI ≤25). Unadjusted analyses provided similar results to those with covariate control, so only those results with full covariate adjustment were reported. Finally, to examine whether improved sleep quality was significantly influenced by body weight, parasympathetic tone or cardiorespiratory fitness, changes in weight, rMSSD and VO2peak were added to the ANCOVA and logistic regression analyses. Additionally, among completed participants, changes in MOS SPI score were evaluated across quartiles of change in body weight, rMSSD and VO2peak following adjustment for age, treatment, BMI, sleep medication use, HRT use and baseline MOS SPI score. Analyses were limited to participants with baseline MOS Sleep data. Primary analyses were conducted using the intent-to-treat principle; if postintervention data were missing, baseline values were carried forward for analysis. When analyses were restricted to only those participants with baseline and postintervention MOS Sleep data (n=359), results were not substantively changed; similarly, when missing postintervention data were imputed with mean values, results were unchanged. Therefore, only intent-to-treat analyses were presented. All analyses were performed using SAS V.9.2 (SAS Institute). All tests were two-tailed, with statistical significance set at p≤0.05. A summary of participant characteristics is provided in table 1. Mean age and BMI of the 437 participants were 57.3±6.5 years and 31.8±3.9 kg/m2, respectively. Baseline continuous MOS SPI values and odds of sleep disturbance across quartiles of BMI, rMSSD and VO2peak are shown in table 2. Sleep quality significantly differed among quartiles of rMSSD (F3,343=2.55, p=0.05), with the lowest quartile of rMSSD having significantly worse baseline sleep quality than the other quartiles of rMSSD. Similarly, each quartile of rMSSD was associated with lower odds of having significant sleep disturbance at baseline compared with the lowest quartile of rMSSD. No differences in MOS SPI values or odds of having significant sleep disturbance were observed across quartiles of BMI or VO2peak. Changes in diet and unsupervised activity have been previously reported.14 ,22 Preintervention to postintervention changes in energy intake did not differ between treatment conditions. Pedometer-assessed unsupervised activity ranged from 4766 to 5067 steps/day at baseline and did not differ between groups. Compared with baseline, daily steps increased for each group at month 1 (each p<0.05), with greater steps in the control group than the three exercise groups (each p<0.05). However, no differences in daily steps between the control and exercise groups were observed by months 5 and 6. Among the exercise groups, daily steps did not change from months 1 through 6. Therefore, the results reported here are unlikely to be due to changes in diet or spontaneous activity outside the exercise training laboratory. Changes in sleep quality with exercise training are depicted in figure 2. A significant effect of the intervention was noted in the full model (F8,428=17.35, p<0.001), with treatment group being an independent predictor of change in continuous MOS SPI score (F3,428=2.79, p=0.04) following control for age, BMI, HRT use, sleep medication use and baseline MOS SPI values. Moreover, a significant linear dose–response effect was found for MOS SPI scores across treatment groups (p=0.02). When compared against control, a significantly greater improvement in MOS SPI score was found for the 12 KKW group (p=0.02). Change in Medical Outcomes Study (MOS) Sleep Problems Index (SPI) scores among treatment groups. Data presented as least-squares means±95% CIs. Analyses adjusted for age, body mass index, sleep medication use, hormone replacement therapy use and baseline MOS SPI score. Asterisk indicates difference from control (p=0.02). KKW, kilocalories of energy expenditure per kilogram of body weight per week. The association between sleep disturbance (ie, MOS SPI >25) at postintervention and treatment is summarised in table 3. Compared with control and following covariate adjustment, each exercise training group had lower odds of having significant sleep disturbance following the intervention, with the odds of having significant sleep disturbance decreasing while exercise dose increased (linear trend p=0.01). Postintervention changes in body weight, parasympathetic tone and cardiorespiratory fitness for the overall DREW sample have been previously reported.14 ,19 In the present study's sample, the magnitude of weight loss did not differ between treatment groups (control: −1.08 (3.70), 4 KKW: −1.23 (3.43), 8 KKW: −1.60 (3.23), 12 KKW: −1.25 (2.83) kg; F3,433=0.43, p=0.73). Cardiorespiratory fitness improved with exercise training in a dose–dependent manner (control: −0.20 (1.88), 4 KKW: 0.59 (1.83), 8 KKW: 1.13 (1.54), 12 KKW: 1.42 (1.79) ml/kg/min; F3,433=15.32, p<0.001). Among those with usable HRV and sleep data (n=351), rMSSD improved in a dose–dependent fashion with exercise training (control: 0.20 (8.45), 4 KKW: 2.72 (9.20), 8 KKW: 3.72 (11.47), 12 KKW: 5.29 (9.51) ms; F3,347=3.82, p=0.01). When added to the model analysing differences in continuous MOS SPI change among treatment groups, none of these covariates were significant (p≤0.14), and inclusion of these variables did not alter the previously noted treatment group differences or linear dose–response effects. When individually added to logistic regression analyses, none of these covariates significantly affected the odds of having significant sleep disturbance at postintervention (table 3). In addition, when change in MOS SPI was evaluated across quartiles of change in body weight, rMSSD or VO2peak, no significant between-group differences were noted (data not shown). Finally, change in MOS SPI did not correlate with change in body weight, rMSSD or VO2peak (r<0.03, p>0.58). The key finding from exploratory analyses of the DREW randomised controlled trial was that exercise training significantly improved subjective sleep quality in overweight/obese postmenopausal women. Specifically, we observed a dose–response trend for the continuous MOS SPI values and, perhaps most notably, significantly reduced odds of having sleep disturbance at postintervention with even 50% of the recommended dose of exercise for adults. Interestingly, the improvements in sleep quality were not related to changes in body weight, parasympathetic tone or cardiorespiratory fitness. When considering the improvements in continuous MOS SPI scores following exercise training, the clinical significance is uncertain. The observation that only those who exercised at a 12-KKW dose experienced a significant improvement in sleep quality compared with control may be viewed as discouraging, as this dose equated to approximately 190 min/week of moderate-intensity aerobic exercise14 and many individuals may not be willing to perform that much exercise to improve sleep. However, the significant dose–response effect suggests that any dose of exercise should benefit sleep, albeit with larger effects noted with higher levels of energy expenditure. Nonetheless, in the present study, changes in body weight, parasympathetic tone or cardiorespiratory fitness were not significantly related to changes in sleep, whether assessed by covariate control, change in sleep quality across quartiles of change in these variables or correlations between change in these variables and change in sleep quality. Although significant improvements were noted for rMSSD and VO2peak following exercise training in this sample,14 ,19 the variability associated with the sleep measure used in the current study may have masked any possible associations. The present study suggests that exercise training can result in improved sleep quality independent of weight loss, increased fitness or improved autonomic balance. Strengths of the study include a randomised controlled design, closely supervised intervention, use of a validated measure of sleep quality and the largest experimental sample size to investigate the effects of exercise on sleep. The study population was another strength, as the prevalence of disturbed sleep was high. Finally, assessment of variables that are related to sleep quality and may contribute to improved sleep following exercise training was another strength of the study. A lack of assessment of obstructive sleep apnoea (OSA) was another limitation. Although OSA is considered to be a male-dominated sleep disorder, postmenopausal OSA prevalence is similar between men and women.33 Moreover, excess weight is the primary cause of OSA for most adults,34 which would place this overweight/obese sample at even higher risk for OSA. Evidence suggests that exercise, in the absence of more established treatments or significant weight loss, is moderately efficacious at reducing OSA severity and improving sleep.35 However, dose–response effects of exercise on OSA severity are unknown. In summary, in a sample of overweight/obese postmenopausal women, exercise training significantly reduced the odds of having significant sleep disturbance. These improvements in sleep were independent of the effects of exercise training on body weight, parasympathetic tone or cardiorespiratory fitness. Additional research with more comprehensive measurement of sleep is warranted, but exercise training appears to significantly improve sleep quality in postmenopausal women. We thank the DREW participants and the Cooper Institute staff for their efforts on this study.
. Sleep difficulty in women at midlife: a community survey of sleep and the menopausal transition. Menopause 2003;10:19–28. National Institutes of Health. National Institutes of Health State-of-the-Science Conference statement: management of menopause-related symptoms. Ann Intern Med 2005;142:1003–13.
. The efficacy and safety of drug treatments for chronic insomnia in adults: a meta-analysis of RCTs. J Gen Intern Med 2007;22:1335–50.
. Sleep and menopause. Curr Neurol Neurosci Rep 2009;9:165–72.
. Hormone therapy and sleep quality in women around menopause. Menopause 2005;12:545–51.
. The effect of estrogen plus progestin treatment on sleep: a randomized, placebo-controlled, double-blind trial in premenopausal and late postmenopausal women. Climacteric 2008;11:233–43.
. Epidemiology of exercise and sleep. Sleep Biol Rhythms 2006;4:215–21.
. Effects of exercise on sleep. Clin Sports Med 2005;24:355–65.
. Effects of a yearlong moderate-intensity exercise and a stretching intervention on sleep quality in postmenopausal women. Sleep 2003;26:830–6.
. Lack of perceived sleep improvement after 4-month structured exercise programs. Menopause 2007;14:535–40.
. Menopausal status, moderate-intensity walking, and symptoms in midlife women. Res Theory Nurs Pract 2005;19:163–80.
. Moderate-intensity exercise and self-rated quality of sleep in older adults. A randomized controlled trial. JAMA 1997;277:32–7.
. Dose response to exercise in women aged 45-75 yr (DREW): design and rationale. Med Sci Sports Exerc 2004;36:336–44.
. Effects of different doses of physical activity on cardiorespiratory fitness among sedentary, overweight or obese postmenopausal women with elevated blood pressure: a randomized controlled trial. JAMA 2007;297:2081–91. NIH Consensus development panel on physical activity and cardiovascular health. Physical activity and cardiovascular health. JAMA 1996;276:241–6.
. Sleep measures. In: Stewart AL, Ware JE Jr., eds. Measuring Functioning and Well-being: The Medical Outcomes Study Approach. Durham, NC: Duke University Press 1992:235–59.
. Psychometric properties of the medical outcomes study sleep measure. Sleep Med 2005;6:41–4.
. Psychometric evaluation and tests of validity of the medical outcomes study 12-item sleep scale (MOS sleep). Sleep Med 2009;10:531–9.
. Heart rate variability characteristics in sedentary postmenopausal women following six months of exercise training: the DREW study. PLoS One 2008;3:e2288. Task Force of the European Society of Cardiology and the North American Society of Pacing and Electrophysiology. Heart rate variability: standards of measurement, physiological interpretation, and clinical use. Eur Heart J 1996;17:354–81.
. Statistical Power Analysis for the Behavioral Sciences. 2nd edn. Philadelphia, PA: Lawrence Erlbaum Associates, Inc, 1988.
. Changes in weight, waist circumference and compensatory responses with different doses of exercise among sedentary, overweight postmenopausal women. PLoS One 2009;4:e4515.
. Eszopiclone in patients with insomnia during perimenopause and early postmenopause: a randomized controlled trial. Obstet Gynecol 2006;108:1402–10.
. Sleep-related disturbances and physical inactivity are independently associated with obesity in adults. Int J Obes (Lond) 2007;31:1713–21.
. Sleep disturbance and obesity: changes following surgically induced weight loss. Arch Intern Med 2001;161:102–6.
. Heart rate variability in insomniacs and matched normal sleepers. Psychosom Med 1998;60:610–15.
. Improvements in heart rate variability with exercise therapy. Can J Cardiol 2010;26:303–12.
. Association between sleep quality and physical fitness in female young adults. J Sports Med Phys Fitness 2007;47:462–7.
. The Pittsburgh Sleep Quality Index: a new instrument for psychiatric practice and research. Psychiatry Res 1989;28:193–213.
. Objective and subjective sleep quality in premenopausal, perimenopausal, and postmenopausal women in the Wisconsin Sleep Cohort Study. Sleep 2003;26:667–72.
. Beta/gamma EEG activity in patients with primary and secondary insomnia and good sleeper controls. Sleep 2001;24:110–17.
. Association of sociodemographic, lifestyle, and health factors with sleep quality and daytime sleepiness in women: findings from the 2007 National Sleep Foundation “Sleep in America Poll”. J Womens Health 2009;18:841–9.
. Menopausal status and sleep-disordered breathing in the Wisconsin sleep Cohort study. Am J Respir Crit Care Med 2003;167:1181–5.
. Excess weight and sleep-disordered breathing. J Appl Physiol 2005;99:1592–9.
. The effect of exercise training on obstructive sleep apnea and sleep quality: a randomized controlled trial. Sleep 2011;34:1631–40.
. A randomized controlled trial of the effect of exercise on sleep. Sleep 1997;20:95–101.
. A randomized controlled trial of high versus low intensity weight training versus general practitioner care for clinical depression in older adults. J Gerontol A Biol Sci Med Sci 2005;60:768–76. Contributors TSC and SNB designed and organised the study. TSC, CPE and SNB collected the data. CEK and XS performed the statistical analyses. CEK wrote the first draft of the manuscript. XS, MHH, SDY, CPE, SNB and TSC provided critical input at all stages and critically reviewed and contributed to the final draft. CEK and TSC are guarantors. Funding This work was supported by grants HL66262 and HL082610 from the National Heart, Lung and Blood Institute of the National Institutes of Health, and the American Heart Association Texas Affiliate award 02651404. Life Fitness (Schiller Park, Illinois) provided exercise equipment for this study. The sponsors had no role in the study design, protocol development or in conducting the trial, data collection, data analysis or preparation of the manuscript. Ethics approval This study was approved by Institutional Review Boards of the Cooper Institute (Dallas, Texas) and the Pennington Biomedical Research Center (Baton Rouge, Louisiana). Data sharing statement The data set will be available from the corresponding author as part of an academic collaboration.